Those of you who have listened to or read enough of our ramblings about kits will know that we have certain principles we hold dear and that we like joined-up thinking with away and third kits. With those views in mind, we regard AS Roma’s kit in the 2000-01 season, when they won the Scudetto, as a classic set. We have always had a soft spot for the giallorossi, helped by the fact that we did so well with them on various incarnations of Championship Manager 3 (even if I did once give new signing Stefano Fiore – an AM LC – the number 6 after Aldair retired and I had no other low numbers left). The announcement of a new kit deal with Kappa in the summer of 2000 sealed the deal, however, and indeed a replica of that first home kit is still in our wardrobe. Overall, the look was excellent, with all three shirts following the same design, with shorts and socks also available in all three colours. Being able to use the other shorts and socks options provided a total of 27 different combinations that Roma could have used, which would have made them a footballing version of the Oregon Ducks. As it was, each shirt was only used with just one other variant. Whenever a shorts or socks clash arose in a situation where the home jersey could still be worn, matching shorts and socks were used, similar to when adidas made the kit. 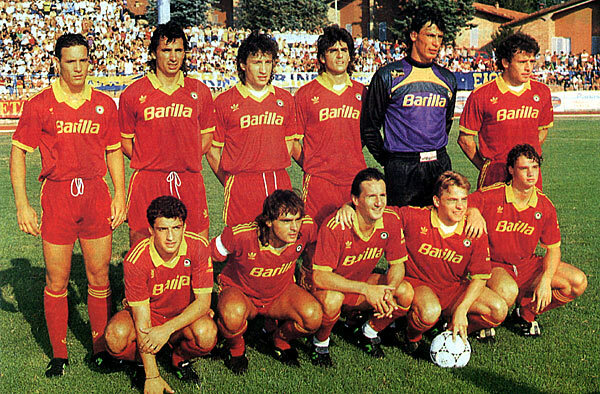 Away to Genoa that season, the away shirt was worn with the home change shorts, despite the fact that Genoa had navy shorts themselves, and against Hamburg (white shirts, red shorts, blue socks) in the UEFA Cup, the third kit had the dark red socks. The opportunity for more combinations came with the goalkeepers’ strips. Having grown up watching Gaelic games, we retain a soft spot for GK shirts which match the design of the outfield versions and Roma ticked this box too. While a pre-season friendly saw the third shirt (and white socks) used, generally speaking, the first-choice keeper kit was a yellow (closer to orange, but given that giallorossi translates as “yellow-red”, we’ll go with that) version of the other three shirts, with red reverse-stitching. It appears that the decision was left with the goalkeeper on matchday as to what shorts and socks to wear as Francesco Antonioli preferred navy while Cristiano Lupatelli favoured red, especially as he also wore them with a long-sleeved white shirt.